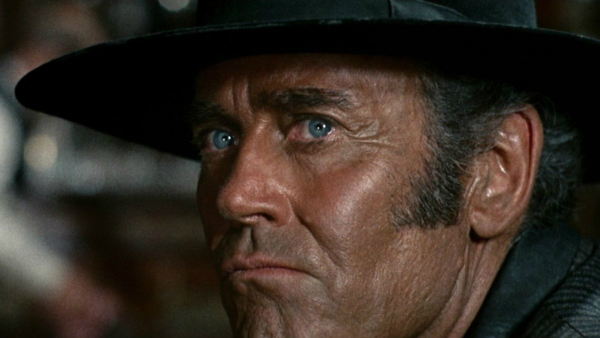 Sergio Leone's 1968 classic “Once Upon a Time in the West” is the purest of his westerns. With his acclaimed "Man With No Name" films, Leone established what had become the archetypal style and mood for any and all deconstructionist westerns that were to follow for the next few decades (at least up until “Unforgiven” in 1992). As such, the story, the characters, and even certain shots and photography choices feel uncannily familiar even to the uninitiated. It is, wielding American studio dollars, an impeccable, high-profile version of the slightly more ragged films that preceded it. All of the qualities listed in the preceding paragraph, however, point to a film that is less an exhilarating “button” on the western genre, and more like an over-thought and overcooked monstrosity. At 165 minutes, “West” has the time to mix innumerable plots and archetypal characters that only interact in a haphazard fashion, the central story only becoming truly clear until more than halfway through. There is the vigilante seeking revenge (Charles Bronson), the railroad magnate (Gabriele Ferzetti), the innocent land-owner everyone wants to kill (Frank Wolff), his soon-arriving wife (Claudia Cardinale), an outlaw (Jason Robards), and a team of vicious criminals led by a scowling Henry Fonda playing – with some success – against type. Eventually, all their relationship will come to make sense, but during the film's elongated running time, you can be forgiven for feeling a bit lost. Leone must have been an enormous fan of Kurosawa, as “A Fistful of Dollars” was an unabashed ripoff of Kurosawa's own “Yojimbo” from 1961. These days, “Dollars” is often considered a straight-up remake of “Yojimbo,” but recall that Toho successfully sued the producers of “Dollars” for plagiarism. I would say that Leone didn't so much plagiarize Kurosawa as change the Japanese master's relatively more staid techniques into something more pulpy and macho. “Yojimbo” was Kurosawa's most cynical film, dispensing the director's usual sense of compassion for a trace of bitterness about humanity not seen in any of his other films. In “Yojimbo,” gangsters are chattel, and the Toshiro Mifune character is their playful, uncaring director. With “Dollars,” Leone latched onto that cynicism, transposing it into the Old West, and creating in the process – perhaps unwittingly – a type of stoic, cinematic machismo that has now branded itself into the minds of young men – and Gen-X filmmakers – for decades. Leone's machismo is in full swing with “West.” The men are all violent and cynical and “cool.” The women are, well, functionaries of the plot; Leone was no feminist. Indeed, the machismo on display in Leone's films is so gruff, the macho actions so calculated, and the macho image so unflappable and so forcefully artificial, that the men eventually begin to read as distasteful. This was malekind presented as its most masculine iteration, and there is something kind of irresponsible about that. Blood revenge is par for the course in this universe, and having a stylized killing gimmick is presented as being the best possible character trait. I understand that this is a heightened universe – a pulp, comic book universe – of moral absolutism, heroes, villains, damsels in distress, and all the other things one finds in boys' adventure novels from a century previous. But I personally find something a bit sour about its macho attitudes. 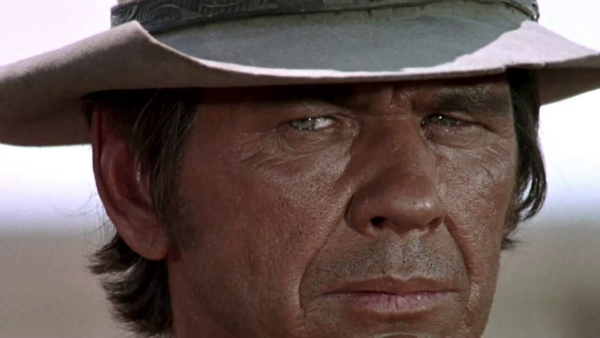 “West” is aesthetically perfect, but I wish it – and other westerns like it – spent less time glorifying violent killers. As I've said many times in the past: Blood revenge is not something that commonly happens in real life, so it irks me how commonly it is used as a motivating factor in feature films. My personal experience with the western genre – if I may skew personal – remains distant and, to the western enthusiast, frustratingly occasional. Having now seen “Once Upon a Time in the West,” however, I feel that I now have workable knowledge with some sort of pivot point in this era of the genre. It is most certainly one of the more perfect examples of western filmmaking, even if it's not, at the end of the day, at all a perfect film. Love the review; even though I am a bit disappointed that, fr extremely valid reasons, you are not very enthusiastic about the genre. This is my favourite western of all time, second to The Good, the bad and the Ugly, and also this movie has my favourite Morricone score.